In Monterey Bay, off the coast of California, researchers have discovered a group of extraordinary marine worms that feed on the bones of dead whales. Even Jules Verne would have difficulty imagining up these creatures whose closest relative may be the tubeworms found at deep-sea vents. On whale bones, only the pinkish trunk of this cross-section of a female Osedax tubeworm is visible. The white blobs are ovaries where more than 100 dwarf male tubeworms can live inside the female. Symbiotic bacteria give the tubeworm's roots their greenish color. Image copyright of Greg Rouse, 2003. In this week's Science, Greg Rouse, a marine biologist at the University of Adelaide in Australia, and others created a new genus, Osedax, which translates as "bone devouring," to classify the new organisms. Upon discovery, the researchers noticed the bone-eating worms "shared some characteristics with the tubeworms at deep-sea vents," says Bob Vrijenhoek, a senior scientist at the Monterey Bay Aquarium Research Institute and co-author of the paper. "But beyond that, we really didn't know how they were related." Subsequent DNA testing revealed the two worms are distant cousins. "It was probably in excess of 100 million years ago the two groups spilt apart," Vrijenhoek says. In 1977, scientists first discovered that entire ecosystems exist at the ocean bottom along deep-sea vents and hydrocarbon seeps. Prior to that discovery, scientists thought life could not exist without sunlight. Symbiotic bacteria that live within the tubeworms process inorganic materials like sulfides or methane and provide nutrients to the worms and surrounding communities. 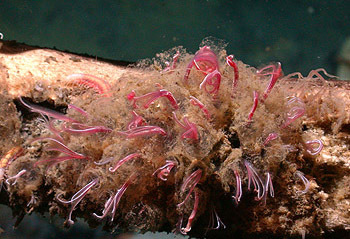 The newly discovered tubeworms contain a type of bacteria that break down fats (a type of hydrocarbon) inside of bones. "They are like termites, with symbiotic bacteria in their guts, but they eat bone instead of wood," Vrijenhoek says. Apart from the use of symbiotic bacteria and the absence of a mouth or gut, the two tubeworms are not very similar. "They are relatively closely related but morphologically very distinct," Rouse says. The tubeworms found at deep-sea vents can grow up to 10 feet in height, but Osedax are only a few inches tall. Another major difference between the tubeworms is the presence of roots. Many of the larger tubeworms have a single root to help anchor them to the seafloor, however, Osedax has roots "a lot like a tree," says Ken Halanych, a marine biologist at Auburn University, who is not associated with the research. The root penetrates the bone and "branches out and grows several different roots," he says. The bone-digesting bacteria reside in these roots. The Tiburon, operated by the Monterey Bay Aquarium Research Institute, grabs the rib of a grey whale from the ocean floor. The red filaments on the bone are the newly discovered tubeworm. Image copyright of MBARI, 2003. Also, unlike tubeworms at deep-sea vents, Osedax is sexually dimorphic. "In other tubeworms, males and females look similar; in these worms, the males are microscopic," Halanych says. The so-called dwarf males, sometimes numbering over 100, live inside the female tubeworms, next to their oviducts. "This is a classic textbook example of bizarre marine invertebrate anatomy," says Cindy Van Dover, a marine biologist at the College of William and Mary in Williamsburg, Va., and the first female pilot for the Alvin research submarine. The researchers who discovered the new tubeworms used an unmanned, remotely operated vehicle, Tiburon. The scientists watched TV screens on the boat while Tiburon scuttled along the seafloor more than 9,000 feet below. They were studying clams that day and found the whale bones and new tubeworms by coincidence. When the whale carcass came into view, it looked "like a thick red carpet covering the bones," Vrijenhoek says. Bacteria in the roots of Osedax produce nutrients by processing the fats and lipids in the bones of whales. 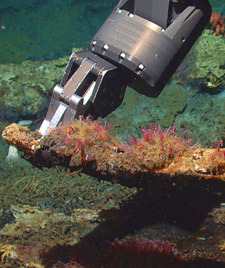 Image copyright of MBARI, 2003. The accidental discovery of the new organisms in the deep ocean underscores the possibility for breakthroughs in understanding the deep ocean. "It is very clear we still don't know a lot about the oceans," Halanych says. "And this [Monterey Bay] is one of the best studied areas of the ocean we have." 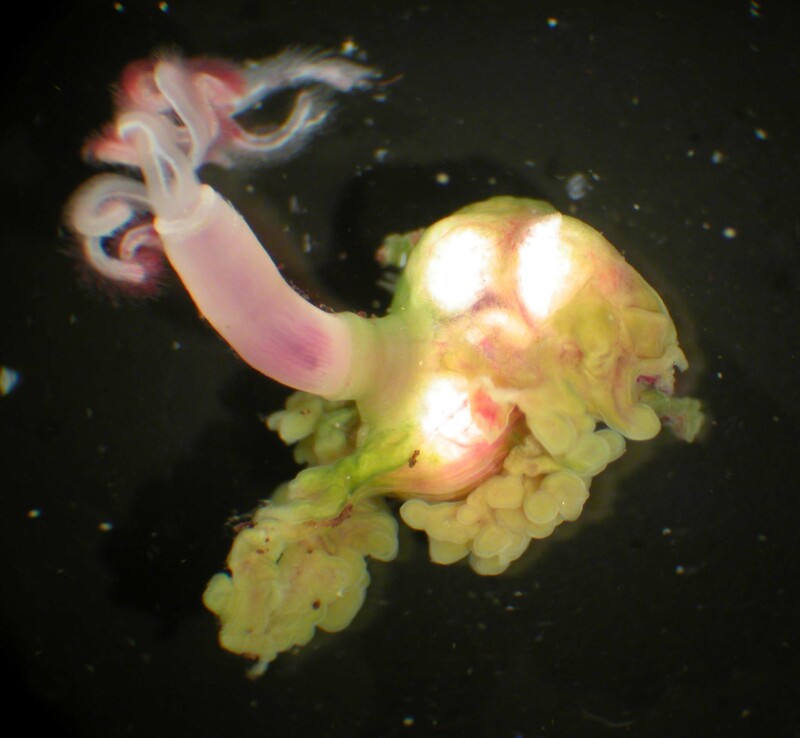 Science - "Osedax: Bone-Eating Marine Worms with Dwarf Males"